Features redemptions for the first 25 picks from 2012 rookie class. 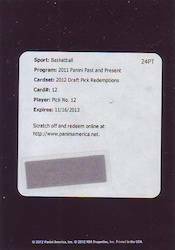 There is also a redemption card for a complete set. 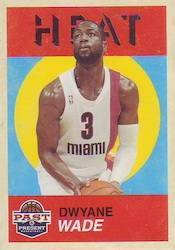 It's no secret that the trading card hobby relies a lot on nostalgia, looking back fondly on the ways things used to be. Another segment of the hobby demands new things. 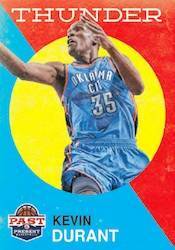 2011-12 Panini Past & Present Basketball aims to do both. Mixing classic and modern, 2011-12 Panini Past & Present offers a retro-style base set and a handful of inserts based around elemental themes that use new technologies. 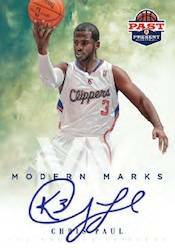 The mid-range release promises four hits per box: three autographs and one memorabilia card. 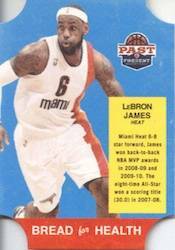 The 2011-12 Panini Past & Present base card design features an isolated player photograph on a colored background. The solid shapes and blocks make the players pop. The result is a distinct design that stands out without being busy. Collectors can also look for short print variations. Headed in the opposite direction are the autograph designs. They emphasize a lot of white, highlighting the signatures. 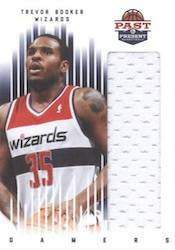 Big-name stars are covered in Modern Marks, a set that has a lot of white at the bottom of the card where the autograph is. As you move up to the player photo, it looks as though they're floating in the clouds, giving a clean and surreal look. A little more obvious are the Breakout autographs, which have a brick wall effect in the background. 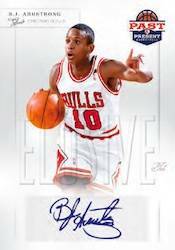 Elusive Ink autographs target players who don't have a lot of autograph cards, giving collectors something new to chase. Except for a cutout player picture, the cards are almost entirely white except for a small nameplate in the top corner and a large, but almost see-through, "Elusive Ink" logo in the middle of the card. Getting elemental, four inserts look to nature for their themes. 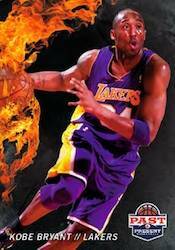 Raining 3s looks to water while Fireworks is drawn to the flame. Breakout and Changing Times opt for texture to give them a unique feel, literally. Each of these inserts have new technologies not used on trading cards before. Other inserts include Bread for Life, Bread for Energy, and Bread for Health. 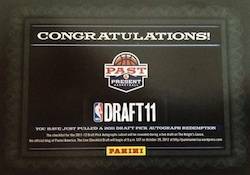 Every 2011-12 Panini Past & Present pack comes with an insert. 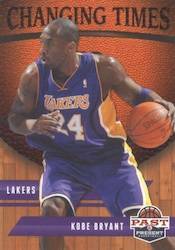 Finally, 2011-12 Panini Past & Present gives collectors their first chance to chase the 2011-12 rookie class. Not only that, they can also look ahead to the 2012-13 crop of rookies. 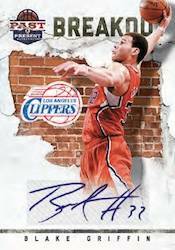 This is the first 2011-12 basketball card set to offer rookie redemptions for both. 2011-12 Past & Present BJ B.J. ARMSTRONG “Elusive Ink” Auto Autograph! Bulls! Will this release on the 9th. Also saw it to be released on the 16th? It does look like it has been pushed back to the 16th. I’ve seen both dates listed. It may also be because Panini limits the first week of sales to hobby shops. I discovered this site while looking up some cards I inherited from my older brother. I hadn’t really practiced the art of collecting cards since I was eight and 20 years later here I am with a passion for collecting trading and learning about various sports cards. I love going through and readIng about different types of cards. My collection is an array of different series, sub series, from sports to politicians and Characters from T.V. Series’s. Such as Star Trek and Babylon 5. This website has an abundance of information to feed the thirsty mind of collectors from all walks of life. MeganWilson � Welcome back. Things have changed a lot in the last two decades. It may be overwhelming at first, but there’s lots out there (including tons on the site) to get you started. We’re also here if you have any questions (as well as a wealth of knowledge on the message boards).